An all in one meal wrapped in an easy to eat package? That you can make in advance? YES to all three! If you’ve been hanging out with me on this blog for awhile, you probably know that seafood and rice are my “thing”. We usually have one or the other or both on our menu at least once a week. Let’s be honest though, usually more. If I go to the ocean, the fish would probably all make a mad dash away from me, screaming to all their friends to get away from her. Not that I’ve ever gone fishing. On my list of things to do. 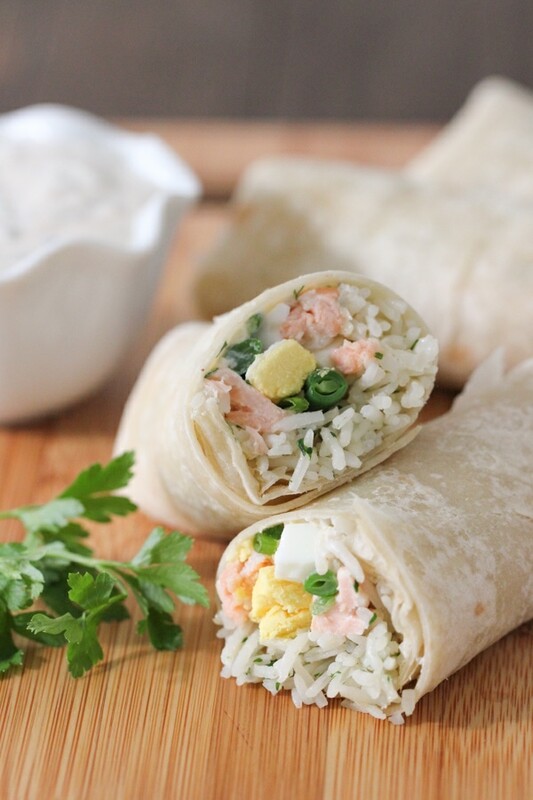 Whenever I make rice or salmon, I like to make just a little bit extra for simple lunches. Leftover rice makes great fried rice (I have a great recipe for Chicken Fried Rice) – throw in some veggies and an egg and you’re good to go. 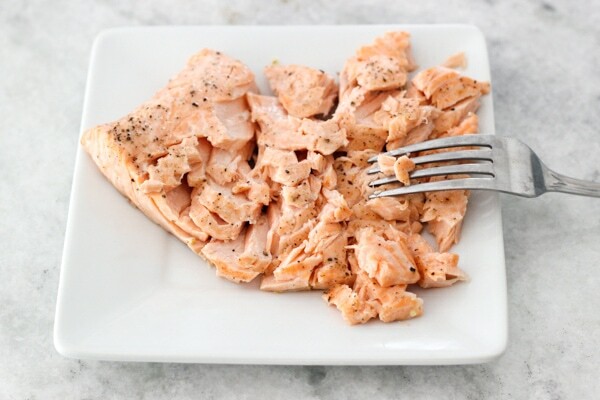 Cold salmon is also great on a sandwich, salad or on that same fried rice. Recently, my husband has been into burritos, so I’ve gotten quite creative with different filling options. That’s how I got the idea to use rice and salmon in the filling. Not only would it use up leftovers that I often have, but I can make the burritos ahead of time. I was going for a similar ingredient combination to what would go into Salmon Kulebyaka, except much easier to make. Wow, was I right! It was 10 times more delicious than either Sergi and I expected. The flavors really come together perfectly and you can eat the burrito cold or heat it up a bit in the oven or microwave. If you want something even more delicious, crisp up the burrito in a skillet until it’s brown on all sides. That is probably my favorite way to eat these. The crisp tortilla really made the burrito all the better. 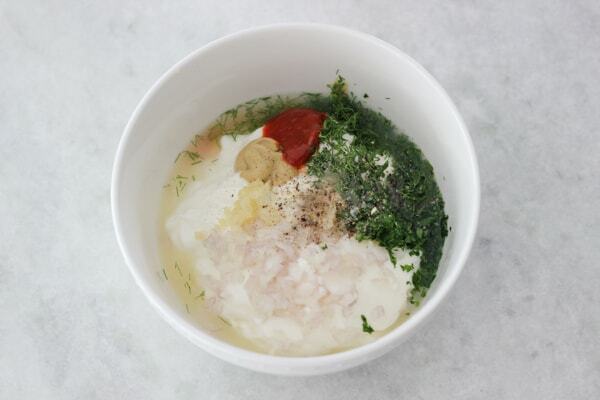 1-2 Tablespoons fresh herbs minced – parsley, dill, etc. 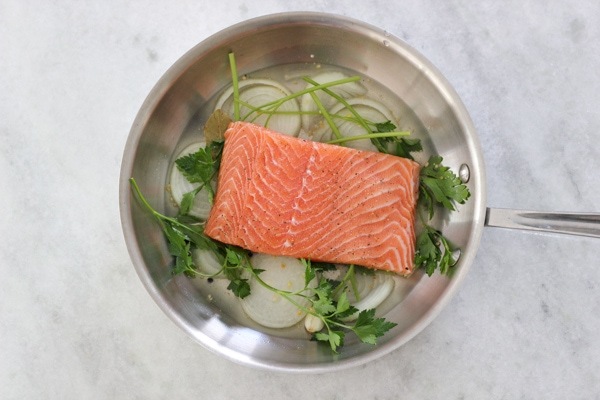 If you have leftover cooked salmon, it works great in this recipe. It doesn’t have to be poached – it can be broiled, roasted sautéed, etc. I have a bunch of Salmon Recipe on my blog, so you can use the leftovers from any of them for this recipe. Keep it cold. Seafood does not reheat well. I LOVE poached salmon. I could go on and on about how juicy and flavorful it is, but I’ll spare you my gushing. 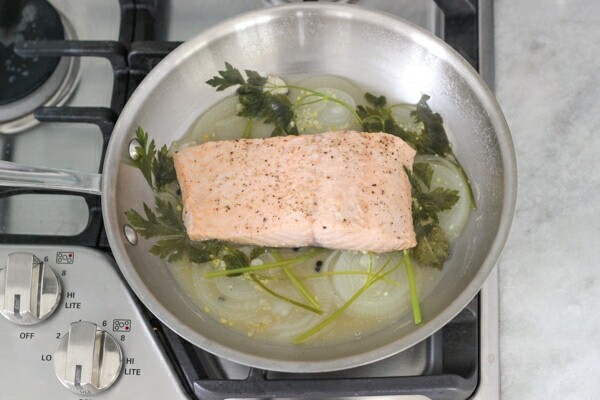 I have a recipe for Poached Salmon on my blog already. Poaching is cooking by simmering in a small amount of liquid. 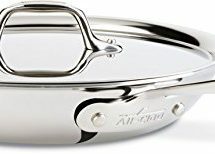 The method I use is a combination of poaching and steaming. 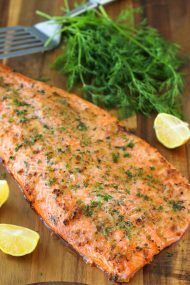 Flake the salmon with a fork into large chunks. 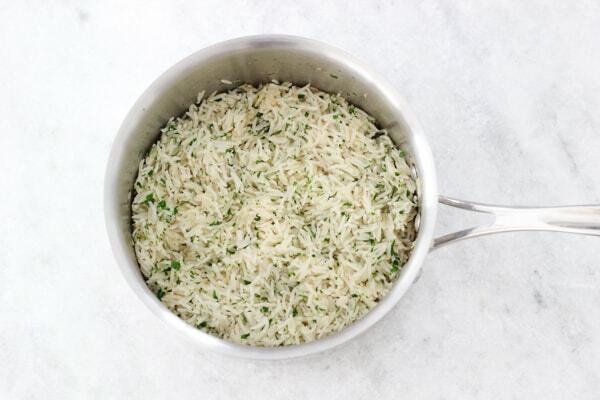 If you have leftover rice, use it in this recipe.You can also use couscous instead of rice. 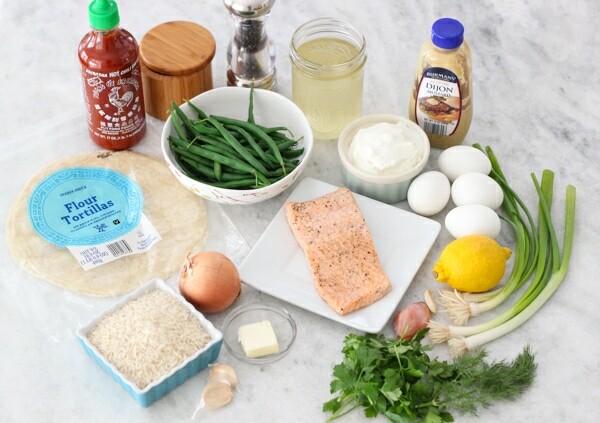 Since I was recreating everything from scratch specifically for this recipe, I poached the salmon, made the rice, cooked the hard boiled eggs and green beans, but technically, this is the perfect time to use up leftovers, or do all these steps in advance. In a saucepan, melt the butter or oil. Add the onion and garlic, season with salt. Cook for about 5 minutes, just until the onions are tender and starting to turn golden. 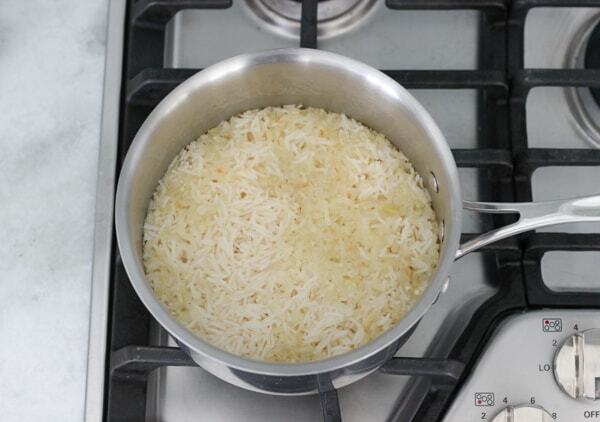 Add the rice and cook it for 2-4 minutes, until every grain is coated in the butter/oil and the rice starts to smell toasted. Pour in the broth. Since it’s hot, it will boil immediately. 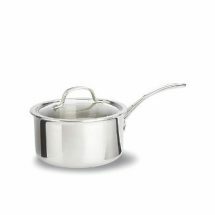 Cover the saucepan right away and reduce the heat to the lowest setting. Cook without uncovering for 15 minutes. Turn off the heat and let it stand for another 5 minutes. Stir in the fresh parsley. Do you see how fluffy the rice is? Peel and chop the hard boiled eggs. I have a recipe for perfect hard boiled eggs here. Cut the cooked green beans into bite sized pieces. You can steam the beans or cook them in boiling water for 3-5 minutes. 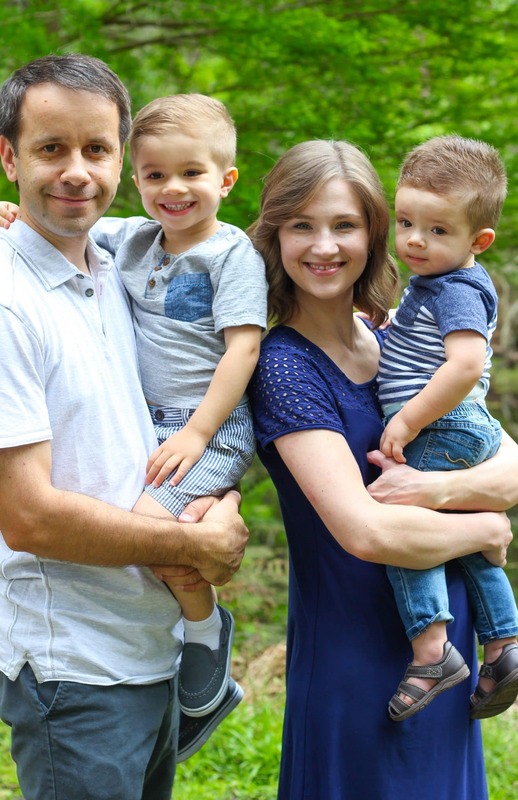 What do my husband and I eat even more often than rice and seafood? Green beans:). Stir all the ingredients for the Yogurt Herb dressing in a bowl. 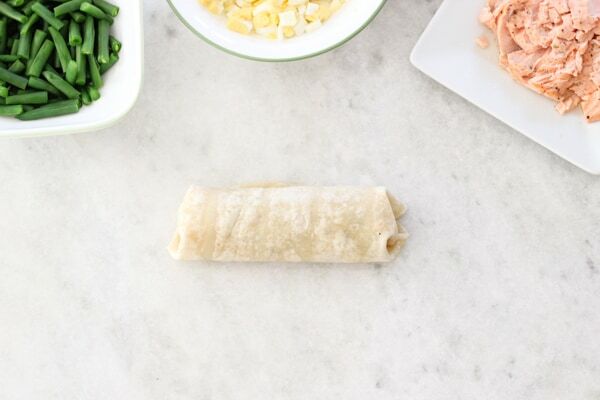 When the rice has cooked, assemble the burritos. Warm the flour tortillas in a microwave, in the oven or on the stovetop. I like to do it in a dry skillet on the stovetop. 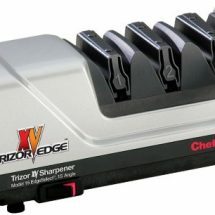 You only need about 10 seconds per side. You just want the tortillas to be heated through and soft, don’t let them get crispy and dry. Scoop a portion of the rice pilaf slightly below the center of the tortilla, leaving some room on both sides. Top with some chunks of salmon. 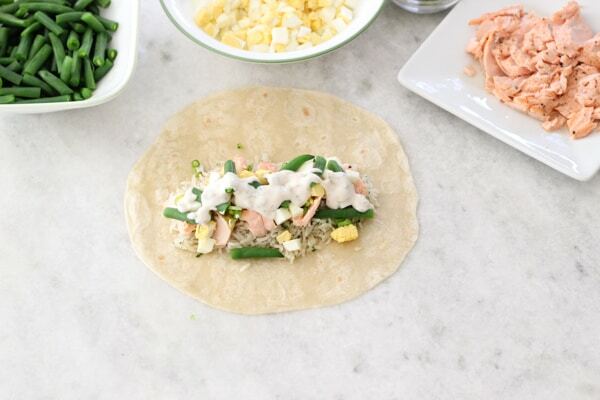 Place the hard boiled eggs, green onions and green beans on top of the rice and salmon. 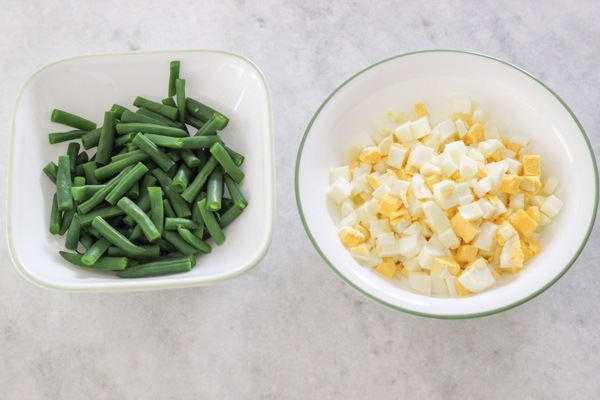 If you have leftover cooked asparagus, broccoli, carrots, mushrooms, etc – use them instead of the green beans. Spoon some of the dressing over all these yummy ingredients. 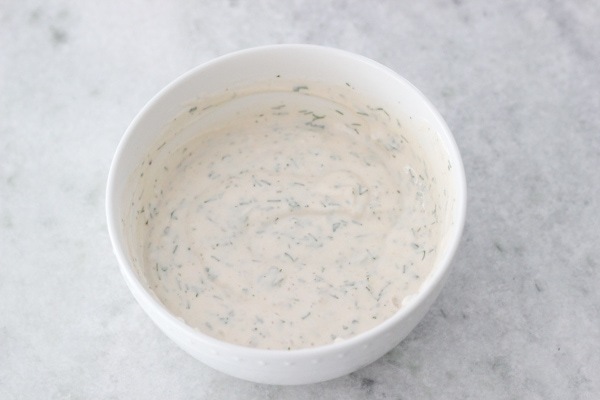 You can also use Ranch Dressing instead of the Yogurt Herb Dressing. Fold the sides in and while you are holding them, bring the bottom of the tortilla over the filling and roll the burrito tightly, squeezing the filling portion back toward you as you roll, until you have a neat burrito. 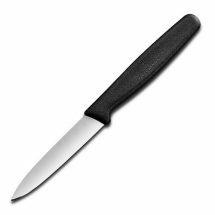 You can eat it whole or cut it in half. If you use large tortillas, you should have about 5-7 burritos. I used medium sized tortillas from Trader Joes, so those yield 7-8 burritos. To serve, you can serve it cold, or warm it up in the microwave or oven. You can also brown the burritos on all sides in a skillet with some oil. Serve some extra Yogurt Herb Dressing on the side. 1-2 Tablespoons fresh herbs minced - parsley, dill, etc. If you have leftover cooked salmon, it works great in this recipe. Keep it cold. Seafood does not reheat well. Otherwise, poach the salmon. Flake the salmon with a fork into large chunks. In a saucepan, melt the butter or oil. 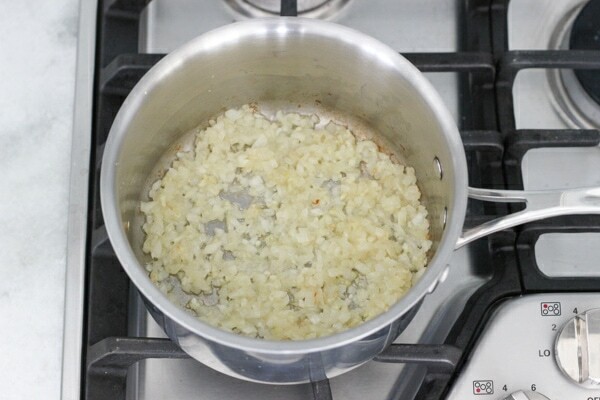 Add the onion and garlic, season with salt. Cook for about 5 minutes, just until the onions are tender and starting to turn golden. 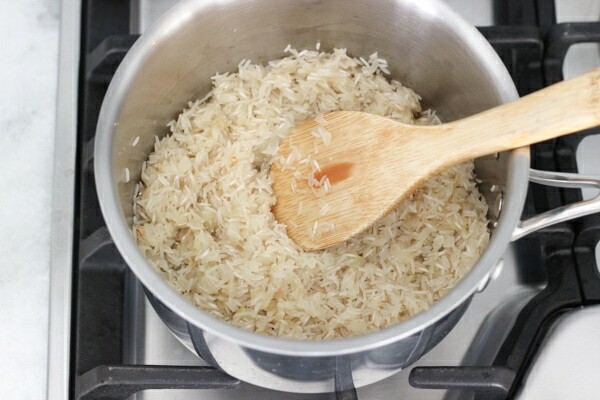 Add the rice and cook it for 2-4 minutes, until every grain is coated in the butter/oil and the rice starts to smell toasted. Pour in the broth. Since it's hot, it will boil immediately. 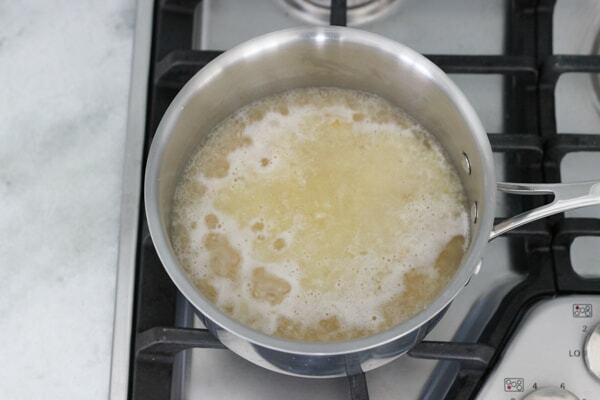 Cover the saucepan right away and reduce the heat to the lowest setting. Cook without uncovering for 15 minutes. Turn off the heat and let it stand for another 5 minutes. Stir in the fresh parsley. 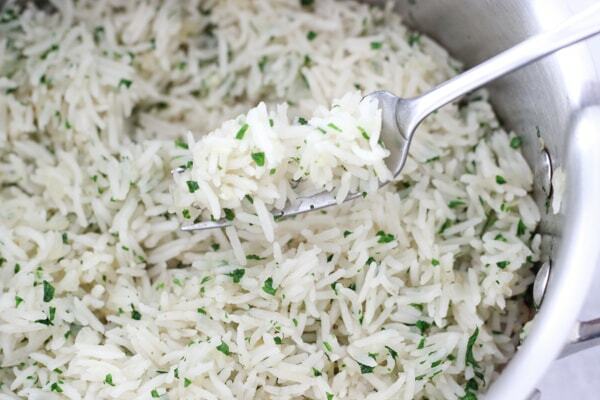 While the rice is cooking, prep the rest of the ingredients. Cut the cooked green beans into bite sized pieces. You can steam the beans or cook them in boiling water for 3-5 minutes. Warm the flour tortillas in a microwave, in the oven or on the stovetop. You just want the tortillas to be heated through and soft, don't let them get crispy. Scoop a portion of the rice pilaf slightly below the center of the tortilla, leaving some room on both sides. Top with some chunks of salmon. 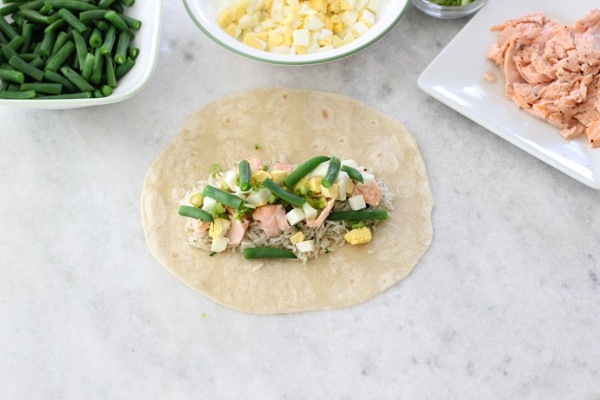 Place the hard boiled eggs, green onions and green beans on top of the rice and salmon. Spoon some of the dressing over all these yummy ingredients. 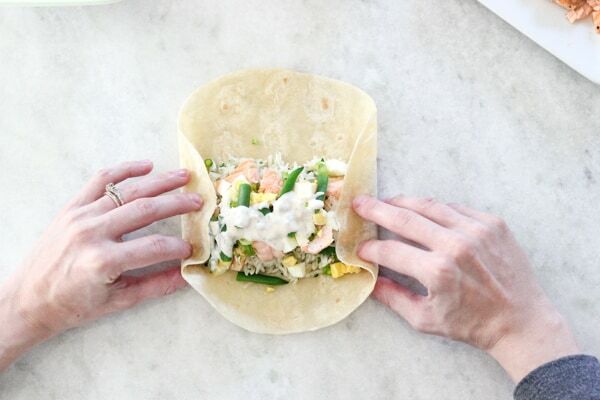 Fold the sides in and while you are holding them, bring the bottom of the tortilla over the filling and roll the burrito tightly, squeezing the filling portion back toward you as you roll, until you have a neat burrito. To serve, you can eat them cold, or warm them up in the microwave or oven. You can also brown the burritos on all sides in a skillet with some oil. Serve some extra Yogurt Herb Dressing on the side. Perfect time to try it. Enjoy! 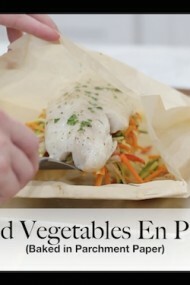 Definitely trying this recipe with my leftover salmon next time. Sounds great, especially fried on all sides! Oh, yes! Golden brown and crispy – my favorite. 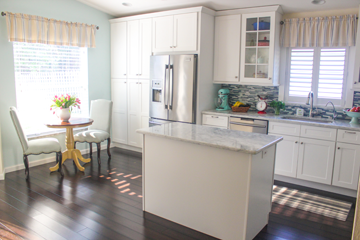 Sounds great for a quick weeknight meal! 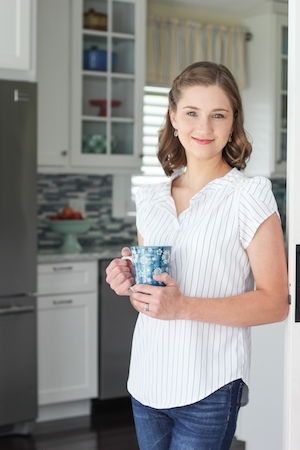 Thanks for the substitutions suggestions as well–love how versatile this recipe is. We like using leftovers–“reinvented”, just like you. 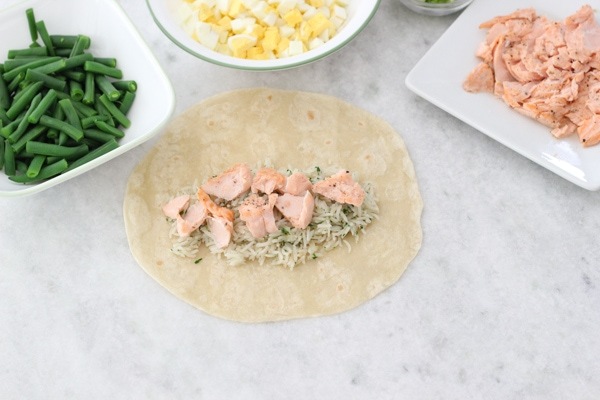 I would like to try this as a salmon burrito bowl, omitting the tortilla, just layer everything in a bowl. Thanks for the inspiration Olga. Your photos are fantastic! Reinventing leftovers is a vey handy skill to have. A burrito bowl is a great idea. For the yogurt sauce can you be a little more specific to the herbs you can/cannot use? As for the rice part, we’re going to use the couscous instead like you suggested. Any alterations to the recipe for that? 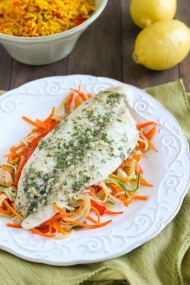 Thank you for this recipe, we’ve been trying to add a little more seafood to our dinners, this will help!! Here’s my recipe for couscous – . As for the herbs, there is no right or wrong answer. It’s a matter of taste preference. 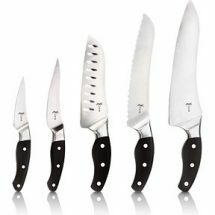 I usually have parsley, dill and green onions on hand, and that’s the flavors that I like. It really is up to you. I don’t think there’s any herb that can’t be used.